The German team celebrate their victory ast the 2014 FIFA World Cup champion. GOETZE has never been a household name but after the winning goal he scored against Argentina at the Maracana on a Malaysian Monday morning which earned Germany its fourth football World Cup, he will indeed be the real life Super Mario. For non-viewers of Children’s Hour television, Super Mario is the Nintendo games cartoon character with great physical prowess, always on the side of good in the battle against invading aliens and a veritable host of evil-doers. Argentina got this far without doing anything spectacular. They made it without Messi ever living up to the burden of expectation to live up to his many titles as World’s best player. As a result Argentina also lost a few fans from amongst Malaysians when he was seen to be showing Zionist sympathies in a widely-circulated photograph, sporting a skull cap. At a time when Israeli military action has resulted in more than 170 deaths in the current conflict in Gaza, Singapore-like support for the Israeli Defence Force (IDF) aggression will only lose you support. From the moment the final whistle was blown to signal the end of the final World Cup game between Germany and Argentina, the Super Mario tag now belongs to this living, breathing, kicking and SCORING forward Mario Goetze. He was brought on as a substitute by coach Joachim Low in the 88th minute, replacing Thomas Klose, who at 36 was the oldest players on the field. Goetze was therefore fresher and fitter than anyone else deep into the second half of extra time. From a move just past the German half way line, he chested a pass from fellow substitute Schurrle and unleashed a left foot volley past the despairing dive of Argentinian keeper Sergio Romero. At that point, we all knew the fate of the game was sealed . This goal was the result of a collective substitutes’ effort. Schurrle was brought in to replace Christoph Kramer who had to be replaced following a collision with Garay. Some substitutions prove crucial, as this one and the other deep in the second half that brought in Goetze. That was how the score stood and the German defence stood resolute for the next 7 minutes. The final whistle blown by referee Rizzoli got the whole of; Brazil leaping for joy. All, except perhaps Neymar, who had prior to the start of the game expressed solidarity with his Barca teammates hoped for an Argentine victory. The Brazilian collective ganging up against Argentina, despite the huge 1 -7 defeat in the semi-finals to Germany is understandable. Two neighbours, two footballing giants; the sight of your enemy winning the biggest trophy in world sport in your own backyard is definitely a prospect too painful to even contemplate. Argentina did actually have one attempt at goal settling at the back of the net – but it was ruled out correctly for offside by an eagle-eyed linesman. 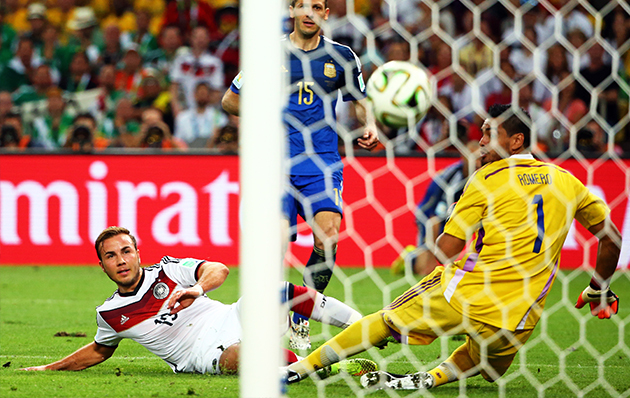 But a similar goal-bound German effort, a header from a corner which hit a post, was also ruled offside. In football they say, these things cancel themselves out. 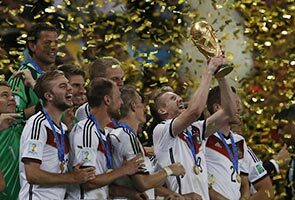 Russia will host the next World Cup and the Germans are sure to be hot favourites, playing on European soil. Furthermore, most of their players are in their early 20s - goal getter Goetze is only 22, as was the supplier of the cross Schurrle. Just imagine how many more World Cups this pair have it in them – Klose who Goetze replaced is a sprightly 36, and look what he did! Brazil will have had four years to rebuild after the mess left behind by Scolari. They will carry out much soul-searching to explain this loss-of-face and come out of it stronger. A nation does not win World Cups and not have a workable formula for further glory– Brazil still stand proud with 6 titles safely in the vault of FIFA World Cup history. England? Their abysmal performance is largely pinned on the luminaries running the game at the top level; its national governing body the English Football Association and the powerful lords of the Premier League that runs the Barclays Premier League; the BPL. Their debate has some similarities with our own rant against the Football Association of Malaysia (FAM). At the start of this tournament, someone did a bit of detective work and dredged out a Berita Harian article whose brash headlines had the FAM back in 1986 or thereabouts, boasting that Malaysia would qualify for the World Cup – in 2014! Hmm.....talk about chest-beating; but then again hope springs eternal! We also wait with bated breath, this time round, for a much-awaited tweet originating from the deepest and dankest Kinabatangan; yet to spring from its most voluble twit(terer). It would be interesting if he’d be making fresh ill-informed reference to Germany’s unfortunate national socialism past and somehow make the connection between Nazism with this World Cup success. Nothing can dampen the celebrations of the Germans though. There’s the small matter of splitting the US$35 million (RM112 million ) cash prize awarded to the winning team with other awards sure to follow. As for us Malaysians – ah well, we do have a national holiday on the occasion of Nuzul Quran tomorrow – a chance to build back our store of reserves after a full month of this World Cup football fest.